The fifth issue of Amethyst Princess of Gemworld shows what happens when worlds collide. The cover features Amethyst standing in her junior high classroom as Granch leans down from a Gemworld portal, pleading for help as he struggles with his demonic siblings. 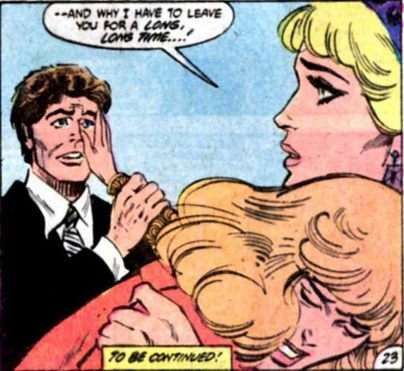 As the issue opens Granch is struggling with his siblings. Some of them are gnawing and clawing at him, which must feel terribly uncomfortable. He tries to reason with them, saying that he hates Dark Opal just as much as they do, but they are a little put out by the fact that he’s been hanging out on the Gemworld for twenty years while they’ve been trapped in the dark dimension. Reason doesn’t appear to be one of their stronger qualities. Granch sees the amethyst fragment floating above him, and he uses one of his brothers as a stepladder in order to reach the gem. He grabs it and decides that he’ll try to use his own magic to resonate with the amethyst in an attempt to get back home. Enunciation is also not one of their stronger qualities. 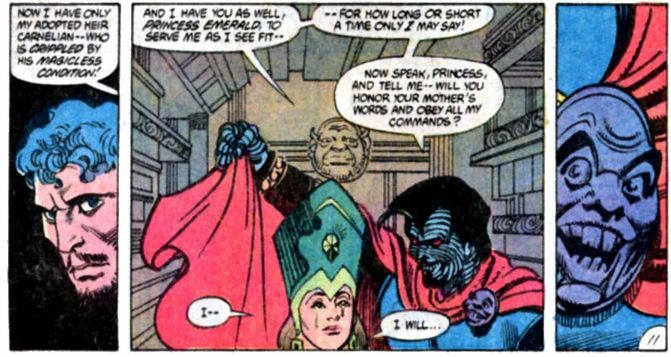 Granch reminds them that Lady Amethyst (Amy’s real mother) waged war against Dark Opal. 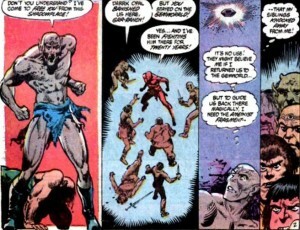 Granch is able to use the power of the stone to subdue his siblings and open a portal. He hopes that their combined power will enable them to finish the evil reign of Dark Opal. 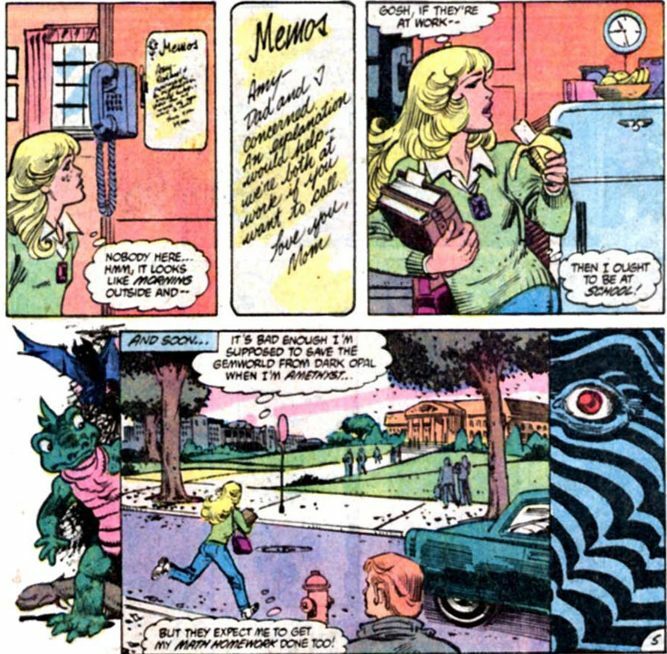 Amy runs to school, thinking that life is tough having to juggle the expectations that she’ll defeat Dark Opal while also finishing her math homework. I think I’d rather fight a despotic evil magic dude than do math homework. I like the way the images from Gemworld frame Amy as she runs off to school. Amy’s dad is a professor at a university which happens to be right across the street from her middle school. He’s about to head into a meeting, but he talks with Amy’s mom. Amy left him a voice mail. Her parents are going to go over to the junior high to pick her up for lunch. Amy’s friend Rita is still wearing a dark opal. It has a creepy glow. CREEPY! Soon Rita’s necklace isn’t the only one glowing. Amy’s necklace starts reacting to something, a portal appears emanating mystical energy, Amy suddenly transforms into Amethyst and Granch and his horror movie reject siblings come crashing through the ceiling, smashing up Amy’s classroom. The teacher orders the students to line up in the hall single file. Granch apologizes, saying that he’s not sure how he ended up on Earth but he needs her help. Amy’s dad sees a flash of purple light and gets a bad feeling that Amy may have something do do with it. He runs out of his meeting. At Dark Opal’s fortress Prince Carnelian thinks he should check up on Princess Emerald. He’s prevented from entering Dark Opal’s chamber when Sardonyx busts out a wrestling move and puts him in a headlock. Sardonyx points out that Opal has been in such a bad mood since Amethyst escaped that it isn’t save for anyone to interrupt him. Dark Opal isn’t happy that Princess Emerald is giving him the silent treatment. He says that it is his will that the heirs to each royal house should serve him in his house that has no true heir. Prince Carnelian overhears this comment. It must be tough being kidnapped at a young age and being adopted by Dark Opal. It certainly seems like Opal could use some parenting lessons. The House of Diamond is where all the extra mystical energy of the Gemworld is stored. The diamond priests sense that their stone has gotten stronger because Princess Emerald’s mystical energy now resides there. Dark Opal has just killed her! 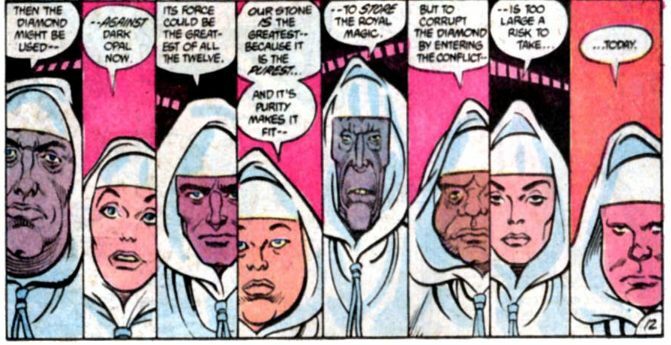 The priests discuss using their diamond against Dark Opal because it is now one of the most powerful stones. They don’t want to risk corrupting the purity of the diamond by entering the conflict at the present time. Granch’s brothers and sisters continue to bust up the middle school, blowing a hole through the wall. Amy’s parents are outside, along with the police and some onlookers. Granch implores them to stop fighting, pointing out that Dark Opal’s enemy Amethyst is present. Amy’s parents recognize her in her adult form. They prevent the police from taking out their guns. Granch’s brothers and sisters start fighting again. Amethyst runs over to her parents and tells them to get away, promising to explain everything to them as soon as she takes care of the situation. Amethyst places most of Granch’s siblings in a containment spell, leaving only a large childlike one free. The police are about to shoot him, but Amy’s mother steps in and uses the power of Child Psychology to calm him down. Topaz continues to sulk about his upcoming marriage. He’s not happy that he has to be stripped of his name and rights to enter a marriage of political convenience. When Topaz joins Sapphire’s house, he’ll take on her name. The Gemworld seems rather progressive when it comes to royal marriages. Sapphire arrives and she and Princess Topaz immediately start bonding while figuring out the seating arrangements. To avoid a fight, Lord Moonstone must be seated far away from Carnelian. Someone has to make sure that Lady Turquoise doesn’t start drunken brawls. Sapphire walks away from Prince Topaz in order to bond with her future sister in law while discussing wedding plans, saying “Goodbye, my love…I count the days till we are yoked as one!” while blowing a kiss. He replies “Yes– yoked together to plow the fields of life…a charming sentiment.” He tells his father that he won’t marry Sapphire because he loves another. Lord Topaz says that they must talk in earnest about Amethyst. Amethyst sends Granch and his siblings back to the Gemworld. She tells him to wait for her at Castle Amethyst and she’ll be along soon. Amethyst is going to have to say goodbye to her parents in order to go back to the Gemworld to fight Dark Opal. This entry was posted in comics and tagged Amethyst Princess of Gemworld on 6/9/2008 by Anna.